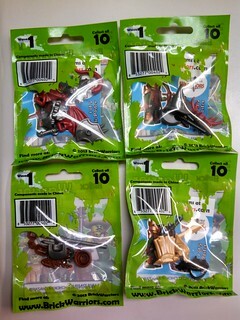 Just came across the BW packs in retail stores as I've seen some MOCs use them. They seem to be made from a much harder plastic so I don't know as far as durability since I've already got some cracks on the armguards. Anybody else has issues with them? I use lots of BW parts and haven't had quality concerns. The ABS they use is a bit harder than TLG's but that mostly hasn't been an issue. I tried to put some Chima wings on the BW armour that has clips on the back and the LEGO parts got scratched. But apart from that, I've been very pleased with BW. I just created a couple of jesters from their latest releases and the minifigs are great. I have zero BrickWarriors, and I want some. 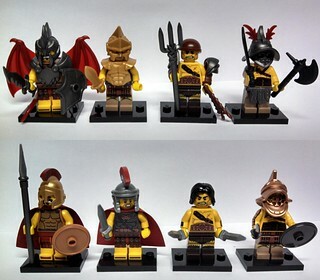 I have heard that they are amazing, and they look great, definitely better than the regular lego ones. Why would much harder plastic crack? I haven't purchased any of BW's vambraces, but I have quite a few of their weapons, headgear, etc. and they're all very well made. I'd recommend them. mpoh98 wrote: I have zero BrickWarriors, and I want some. 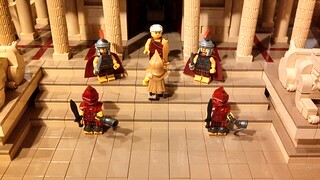 I have heard that they are amazing, and they look great, definitely better than the regular lego ones. Why would much harder plastic crack? I'm guessing since it isn't quite as flexible as other plastic/Lego items it tends to crack instead of, well, flexing (or bending). There is a small hole where the hand should fit but it's a tight fit so the inside plastic connection cracked when I pushed the hand in. It was both an issue for the left and right hands. Ah I see. That's too bad that they cracked, does the maker of BW know? mpoh98 wrote: Ah I see. That's too bad that they cracked, does the maker of BW know? I've cracked a few of mine, but it has always just been a little hairline crack that doesn't affect the integrity of the piece. I had to make that part of the arm guards flat rather than rounded so that the arm can be moved next to the hips, so that leads to that part of the piece being much thinner than I would like. Ah, I see. Not much of a problem, that's good that the can be next to the hip. Well, this doesn't dampen my spirits to get BrickWarriors, I still aim on getting lots in the future, whether by gifts/trade/buying. The buying won't happen for a while, as I can't spend money on lego right now. A little hairline crack isn't too bad, as long as you can't see it from the outside. What store did you find them in so I can keep an eye out? !